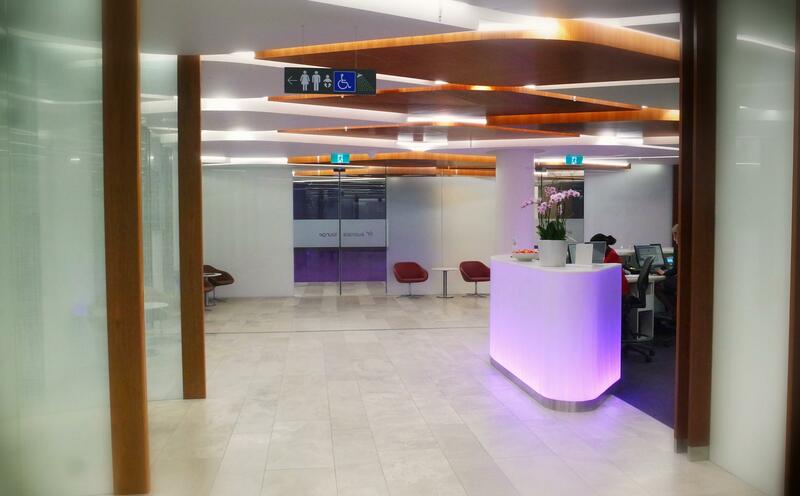 In this overview, we take a look at Virgin Australia’s Perth Lounge, which opened in late 2015 as part of their dedicated Domestic T1 Pier at Perth Airport. 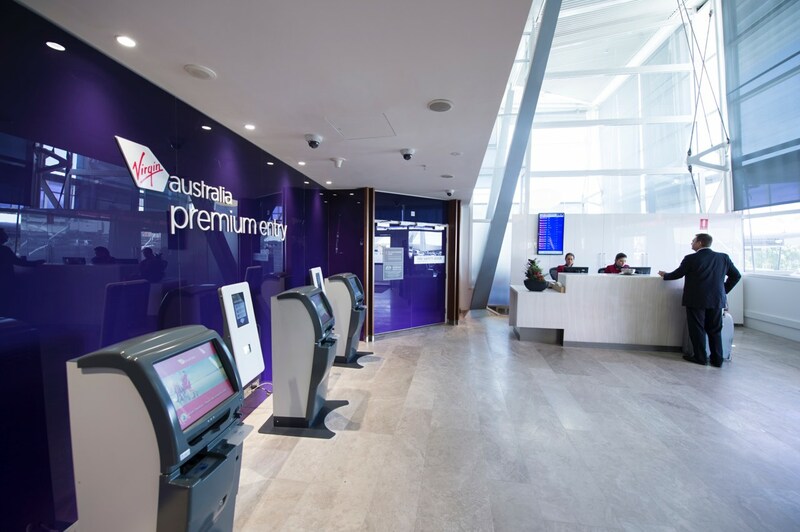 It serves all the Virgin Australia flights leaving Perth, although some smaller regional flights depart from the purpose-built T2 Regional Terminal, where Virgin Australia also have a small lounge. This lounge might be easy to walk straight past if you’re not sure where it is (as I did when it first opened) — it is located directly after security, hidden in a recess to your left as you pass through. The large reception area has a few chairs for guests to sit if they are waiting for someone, as well as a self-entry machine if the counter staff are busy. There is plenty of seating in this wide-open space, with three types of arrangements. 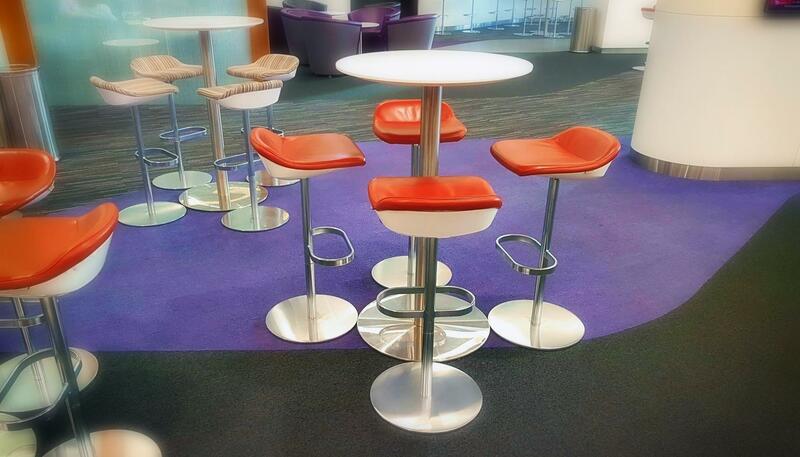 The first are groups of four high bar stools arranged around small cocktail tables, perfect for colleagues are friends to enjoy a few drinks in close company. These are located close to the entrance to the lounge and around the Espresso Bar. Closer to the dining zones are communal long tables—these are the best bet for people who want to eat, drink and work on their computers at the same time. There are power and USB sockets at regular intervals along the middle of the table. Finally, the most common form of seating is groups of simple armchairs arranged around tables. These are found all throughout the lounge, including along the windows. If you really need to work, the Business Centre is quite well hidden behind the Espresso Bar. 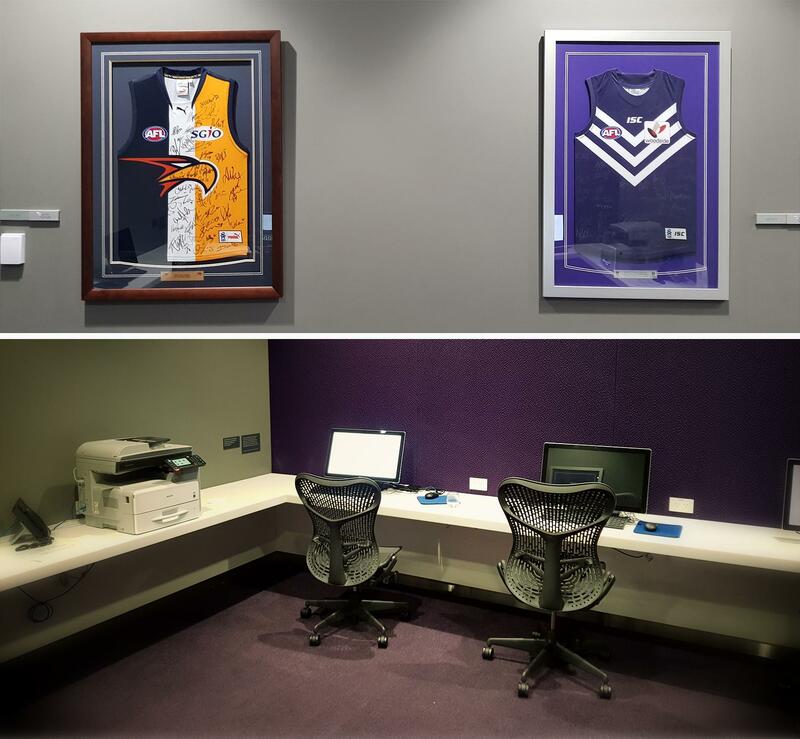 Kitted out with comfortable work chairs and a printer, we found this a perfect place to hide from the crowds and get work done. During the six hours we worked in this lounge, no one came in at all and it was relatively quiet, even during the midnight peak-hour rush. 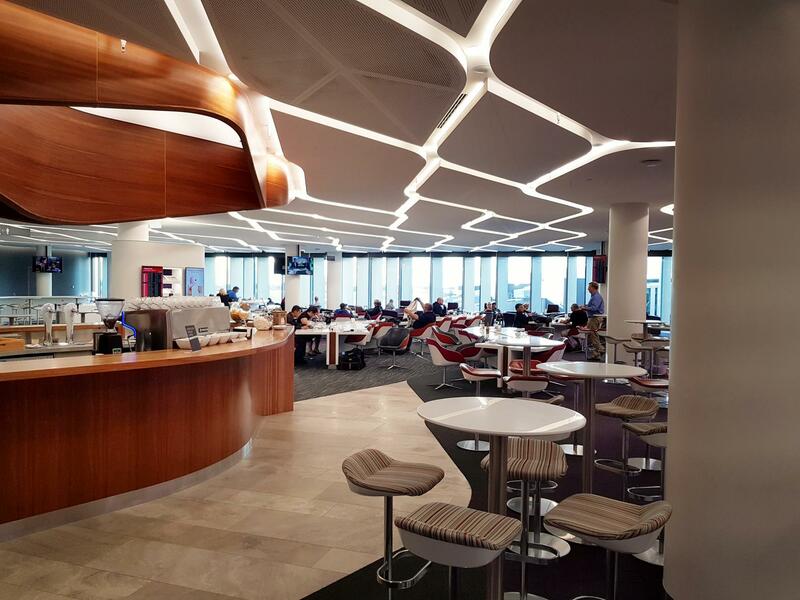 The food and drink offerings in Virgin Australia lounges tend to be similar to the Qantas Clubs’ standard of catering, which usually means an all-day salad and sandwich bar, and the occasional appearance of hot food during peak meal times. 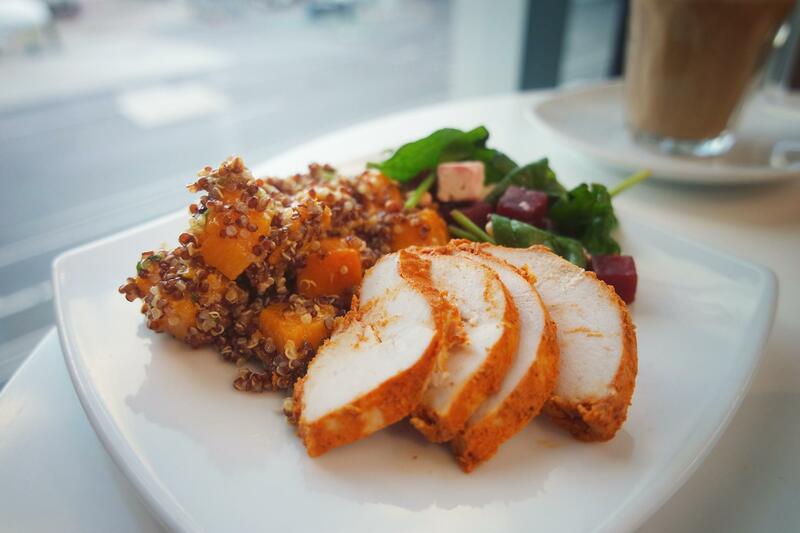 We found the salads to be of high quality, with a quinoa and pumpkin mix being a clear standout. 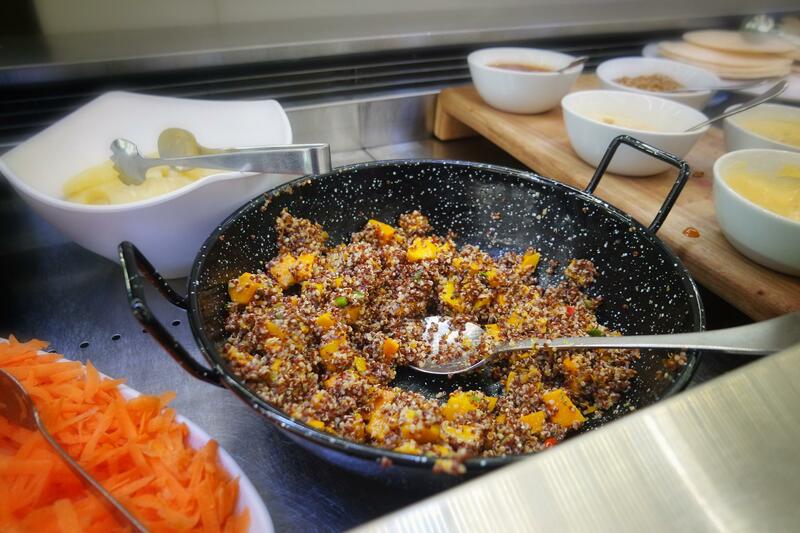 Breads, wraps, ham, chicken, salad leaves, falafel balls, shredded vegetables and a variety of condiments are available to make your sandwiches or salads. 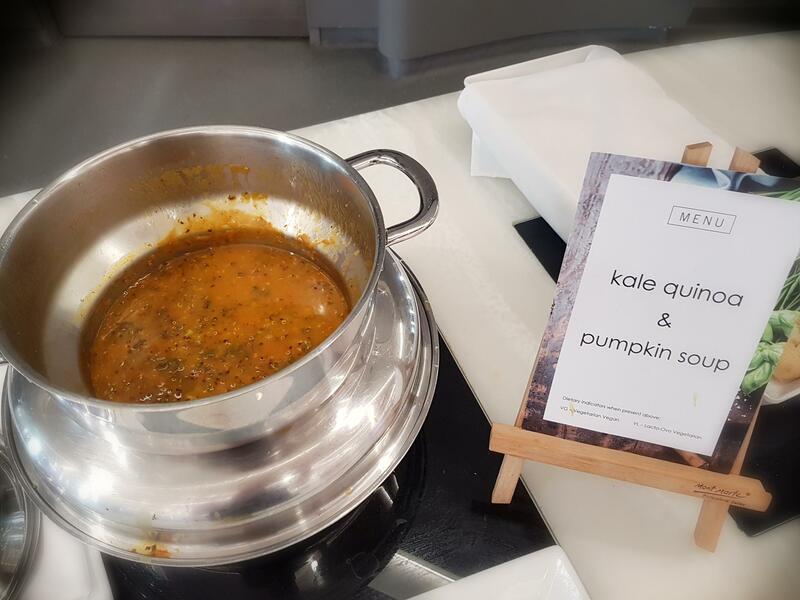 The kitchen must have decided it was efficient to make a soup out of the salad ingredients, because a quinoa and pumpkin soup was also available for afternoon tea. 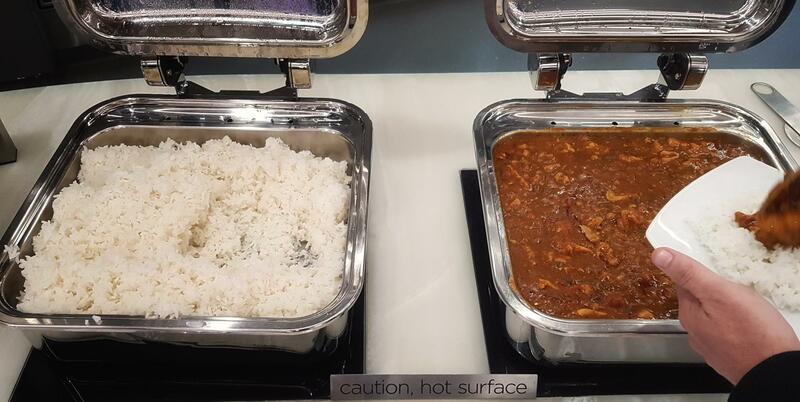 The evening hot dish was Moroccan chicken with jasmine rice. Arancini balls were also walked around and offered to seated guests. 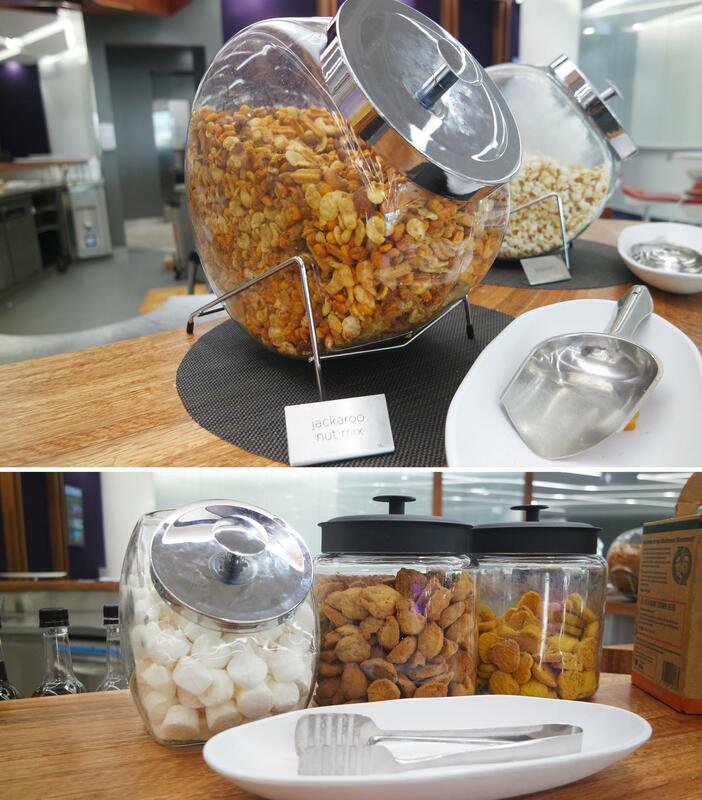 For the peckish, assorted nuts, popcorn, crisps, marshmallows and cookies are available from the Espresso Bar counter. I noticed my partner making multiple trips to this section during our extended stay in the lounge. 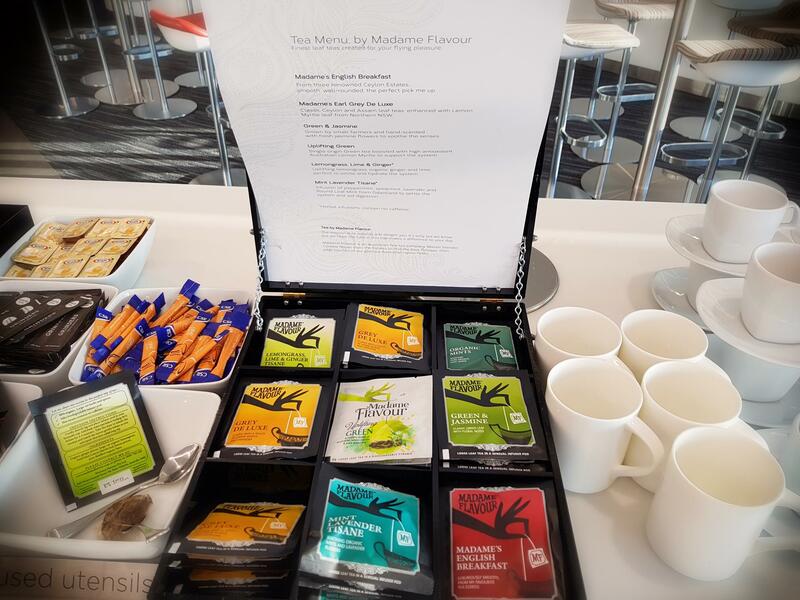 A pleasing selection of Madame Flavour teas are dotted throughout the lounge, near the instant boiling water taps. These are the varieties found onboard their Business Class as well. 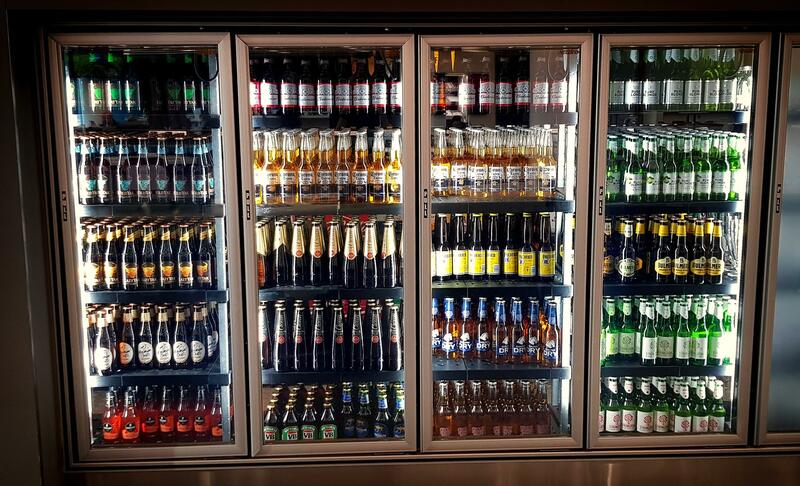 There are a huge variety of beers available from the fridge, as well as five different types of ciders. 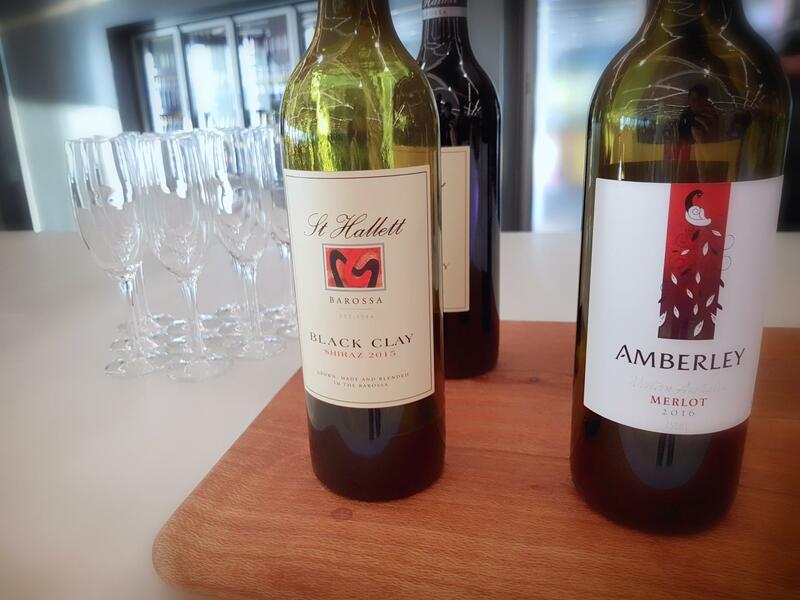 The selection of wines are less inspiring, with all their reds, whites and sparkling wine (Yarra Burn) retailing for under $15 a bottle. 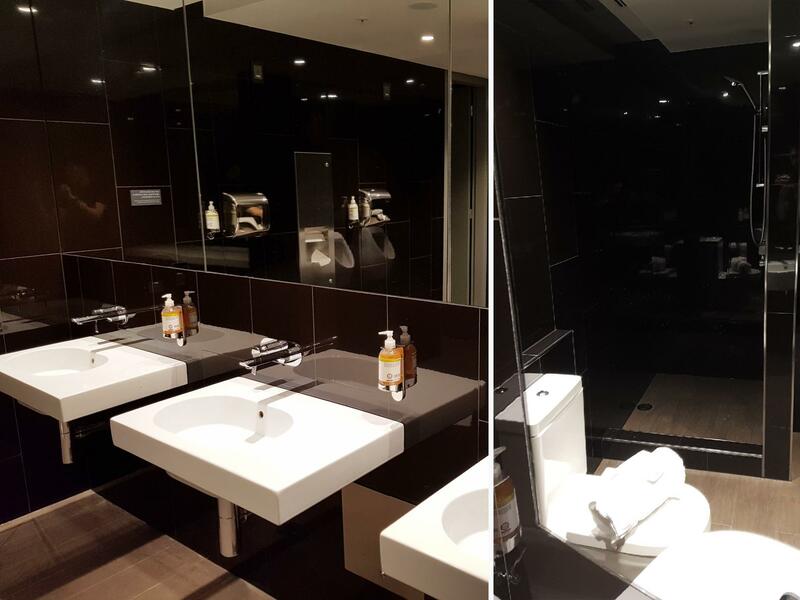 Bathrooms are located just to the right of the reception area, with a classy dark finish. There are a few showers available, which are located in spacious, private rooms, and towels can be obtained from the reception desk. 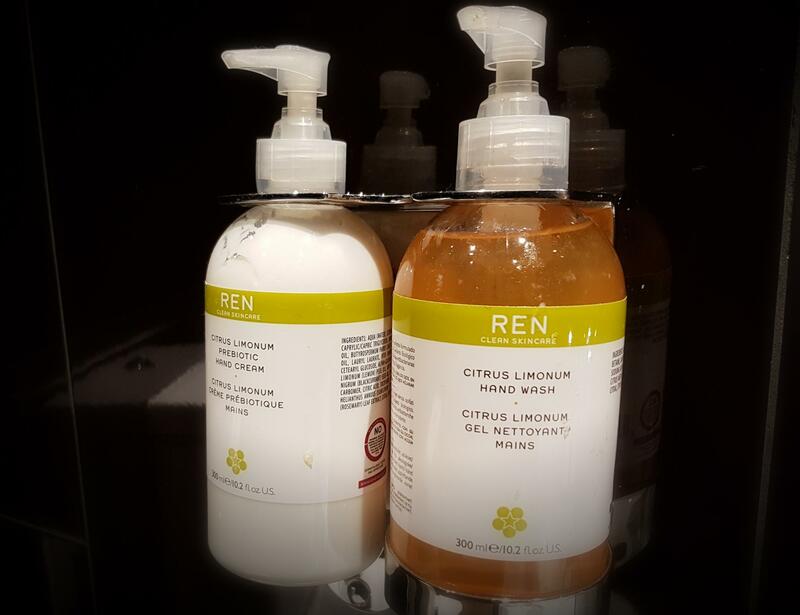 REN skincare products are used throughout the lounge. The showers feature body wash, shampoo and conditioner in separate bottles. 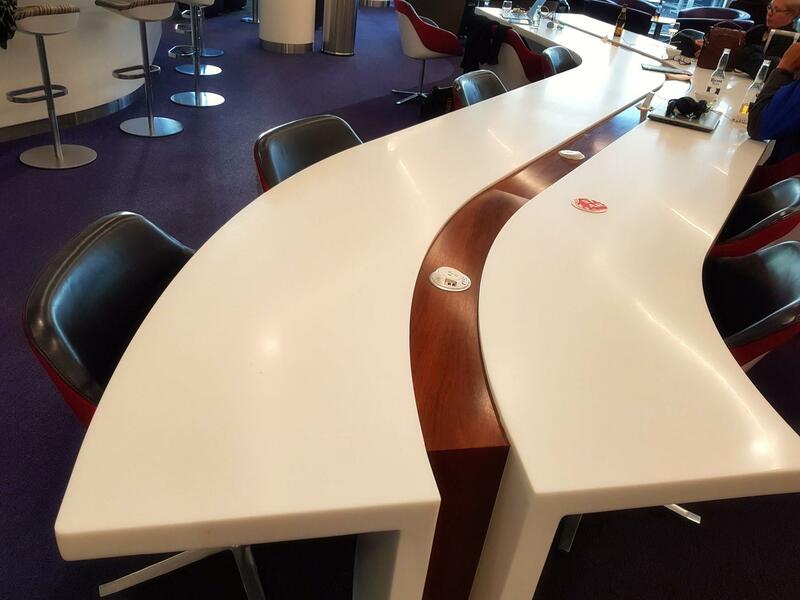 As a domestic premium lounge, there are a wide variety of ways to access. Achieving Velocity Silver will grant you two passes. 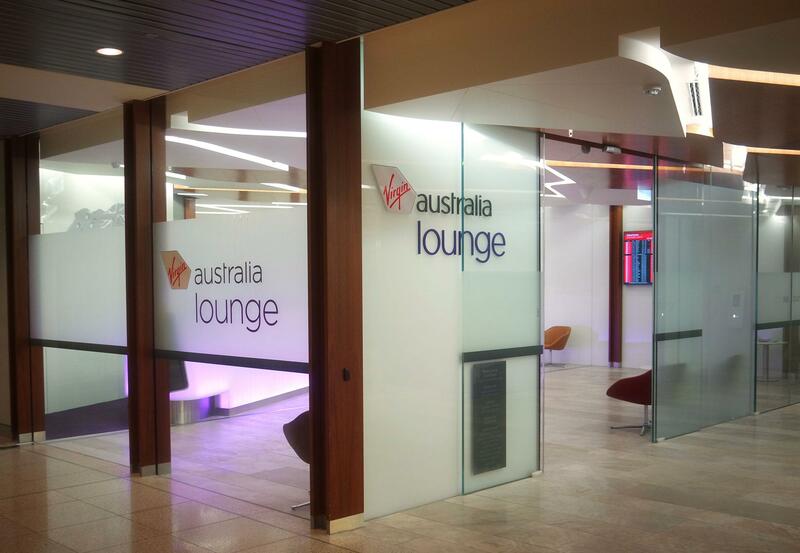 Virgin Australia Business Class guests have entry before and after their flight, subject to space. Unfortunately, you can’t bring any guests in, unlike Qantas Business Class passengers can. 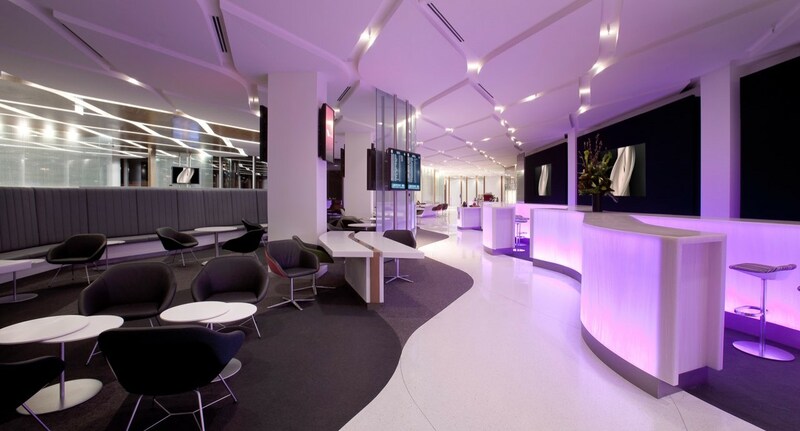 If you are a Virgin Australia Lounge Member or Gold Velocity frequent flyer, then you’ll be able to enter with a guest. 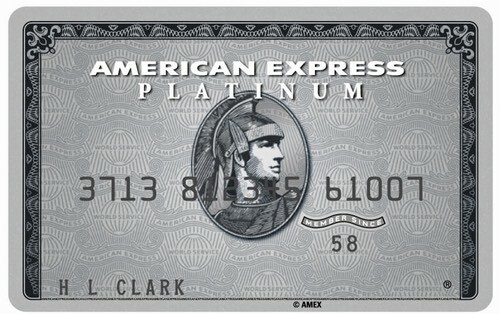 Platinum frequent flyers can bring three guests in. Having Gold status with a number of partner airlines (see below) will also grant you entry with one guest. 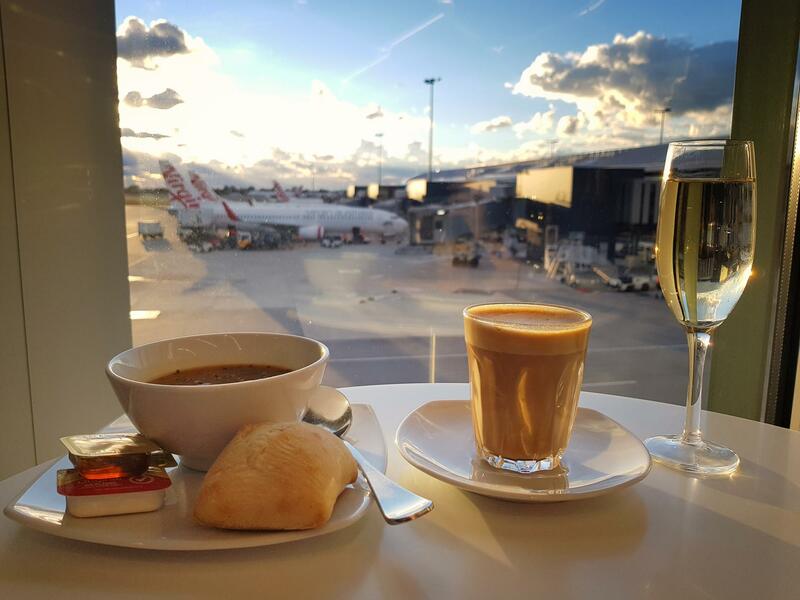 Finally, any Virgin Australia passenger without complimentary access usually can redeem a pass for 10,000 Velocity points (this has to be done a few working days before departure), or buy a day pass for $65 per person. Both of these options also allow access two hours before departure. 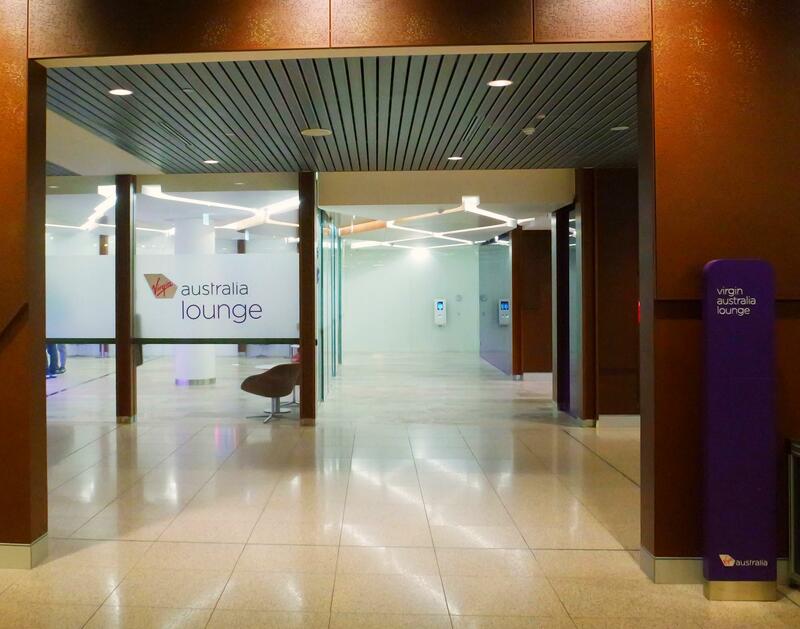 As their newest and most modern lounge, this can currently be regarded as Virgin Australia’s flagship domestic lounge. It is purpose-built, with wide open spaces, lots of seating, decent food and excellent views onto the tarmac. 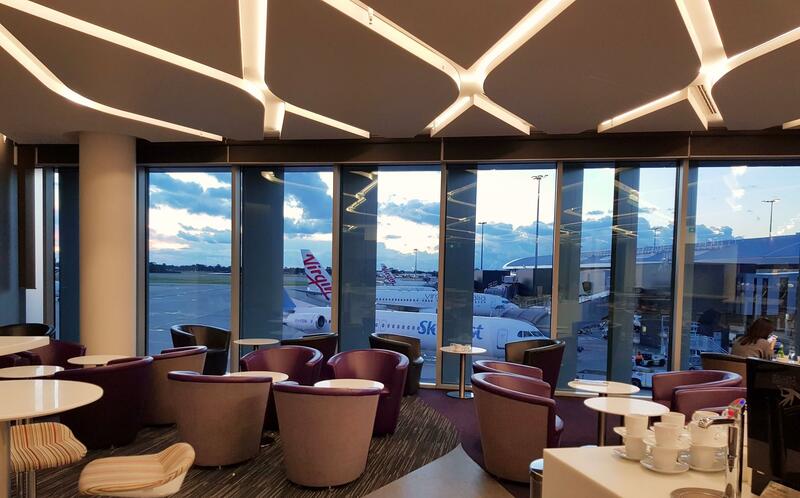 With less hustle and bustle than the busier Melbourne and Sydney lounges, if you have any complimentary single-use passes to redeem, you won’t go wrong at the Perth lounge. 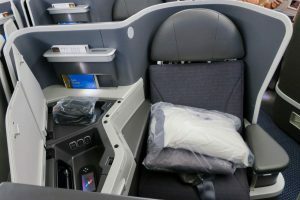 However, we’re not so keen on the value of purchasing a day pass—$65 can go a long way in the terminal for food and drink and 10,000 Velocity Points is enough for a short one-way flight or even a Business Class upgrade. Personally, if I didn’t have access, I would save my points/cash and enjoy some Hungry Jack’s in the terminal. University student by day and planning his next escapade by night - Brandon was thrust into the world of frequent flyer points in late 2015 and has tried to make the most of it since. He finds time to travel in between semesters and is always looking for opportunities to fly in the pointy end. He's also worked hard to surprise his parents with Emirates First Class, and travel with friends in business class on trips abroad.You can find him on Instagram as @bloo.per, as well as running a new food/travel account @flightandbites with his partner. A comfortable lie-flat seat and great catering with professionalism of the crew needing to be improved. A good use of Qantas Points and Asia Miles.